Maybe budgeting for new telescopic bleachers just isn’t in the plan for 2019 but renovations are necessary for both your staff and your students. The best place to start is to take inventory of what you have with a complete Telescopic Seating Inspection for Code Compliance and Safety. An inspection will give insight on the severity of code compliant and safety issues as well as what possible upgrades you could make to your seating. If you truly are interested in upgrades, make sure to let your technician know so they can provide options that best suit your needs and answer any questions while they’re on site. Another item to take into consideration is the overall age of your seating unit as well as the make and model and how easily it can be upgraded while keeping the maximum seating capacity. For instance, if you have an older unit without dedicated aisle and aisle rails, in order to upgrade your unit to include these items, you will lose seating capacity but you will upgrade in safety and code compliance (also decreasing liability). What is the general footprint of your existing bleachers? Do you have room to grow length wise? Do you have room to grow if you were to add additional rows? Are you also wanting to incorporate portable team seating and scorers tables? During this process, be sure to ask questions and get your questions answered. Meaning, if you upgrade your aisle rails, you need to be sure they meet the code requirements referenced in Chapters 1-4. Bottom Line: Do your research and make sure that the people doing the upgrades know what they’re talking about. Code requirements aren’t in place to be a hassle, they’re in place to keep spectators safe. Is your goal to increase seating capacity? Or maybe it is to give your gym a fresh face with an Extreme Logo or Signature Logo Seating. 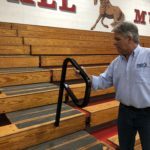 Or perhaps, you have an older model of bleachers that does not have dedicated aisles and aisle rails, and you would like to create ease of access and safety for your patrons. Depending on your overall goal, you do have options. If your seating unit is code compliant and safe, you can add to your school spirit with replacement seats, colored rails, skirt-board logos, step logos, and a fresh full-bleed Safety-End Closure Curtain that blocks unauthorized access to your bleacher’s understructure. Is additional seating your number one goal? If you don’t have it in your budget for a full replacement, we suggest looking into the Maxam1 Portable Bleachers that can be moved throughout the building for multi-use purposes. Not sure if this is right for you? Contact us and try out our sample for a game or two. Drop us a line and let us know what YOU need to move your project forward.